The problem, of course, is that DSLR sales are dominated by two companies: Canon and Nikon. Compact sales are dominated by three companies: Canon, Nikon, and Sony. Thus, a lot of the hopes of the remaining companies lie in mirrorless ramping up and stealing market. 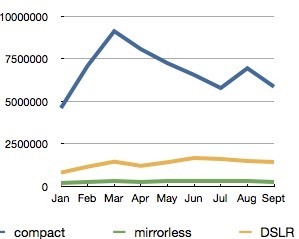 And that's where that flatness in the mirrorless shipments is problematic. The implication is that Fujifilm, Olympus, and Panasonic, even with Nikon and Sony's help, aren't cutting into DSLR sales. That's important, because the average selling price and gross profit margin on the DSLRs are the highest of all cameras, overall. How big is the camera market in the future? How is that market split up between compact, mirrorless, and DSLR? Who will do well in that future market? Fewer compacts, slightly more mirrorless, slightly more DSLRs. Canon and Nikon, and to a lesser degree Sony.